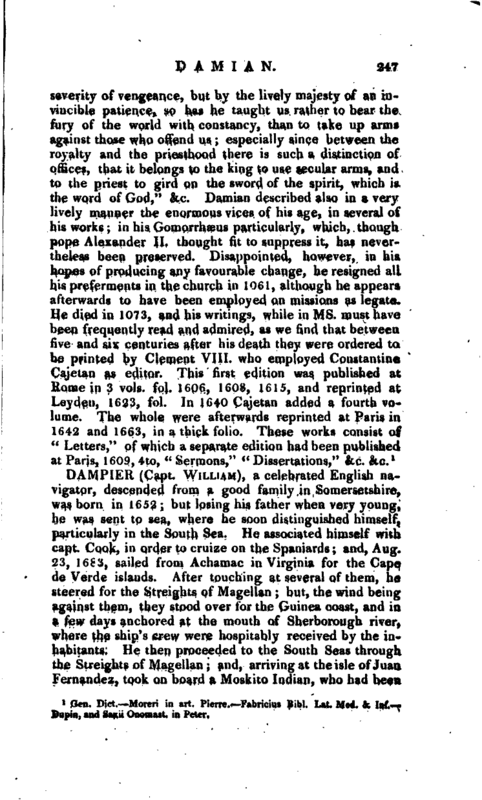 , a celebrated English navigator, descended from a good family in Somersetshire, was bora in 1652; but losing his father when very young, he was sent to sea, where he soon distinguished himself particularly in the South Sea. He associated himself with capt. Cook, in order to cruize on the Spaniards; and, Aug. 23, 1683, sailed from Achamac in Virginia for the Cape de Verde islands. After touching at several of them, he steered for the Streights of Magellan; but, the wind being against them, they stood over for the Guinea coast, and in u few days anchored at the mouth of Sherborough river, where the ship’s crew were hospitably received by the inhabitants. He then proceeded to the South Seas through the Streights of Magellan; and, arriving at the isle of Juan Fernandez, took on board a Moskito Indian, who had been | left in that uninhabited place above three years before. After staying fourteen days at this island, they set sail April 8, 1684, steering towards the line, off the islands of Peru and Chili; took several prizes, and proceeded to the Gallipago islands, and from thence to cape bianco, where captain Cook was interred. July 19, Mr. Edward Davis was appointed captain in the room of Cook, sailed the next day towards Rio Leja, and from thence to the gulph of Amapalla; and Sept. 20th came to an anchor in the island of Plata. Here they made a descent upon Plata, attacked the fort, and took it with little opposition. But finding that the governor and inhabitants had quitted the town, and carried off their money, goods, and provisions, they set fire to it, and afterwards sailed for Guaiquil, and attacked it, but without success. They entered now the bay of Panama: for their design was to look into some river unfrequented by the Spaniards, in search of canoes; and therefore they endeavoured to make the river St. Jago, on account of its nearness to the island of Gallo, in which there is much gold, and safe ancborage for ships. Dampier with some others, in four canoes, ventured to row six leagues up the river; but the Indians, at their approach, got into their canoes, and paddled away against the stream much faster than they could follow. They therefore returned the next morning in order to sail for the island of Gallo; and in their way took a Spanish pacquet-boat, sent with dispatches from Panama to Lima, by which they learned that the armada, being arrived from Spain at Porto Bello, waited for the plate fleet from Lima, which made them resolve to rendezvous among the King’s or Pearl Islands, by which all the ships bound to Panama from Lima must necessarily pass. On May 28th they discovered the Spanish fleet; but night approaching, they exchanged only a few shot. The Spanish admiral, by the artifice of a false light, got the weather-gage of them the next day, and came up to them with full sail, which obliged them to make a running fight of it all round the bay of Panama, and thus their long-projected design ended unsuccessfully. They sailed now for the island of Quibo, where they found captain Harris; and as their late attempt at sea had been fruitless, they resolved to try their fortune by land, by attacking the city of Leon, on the coast of Mexico. This place they took and burnt, and proceeded to Rio Leja, which they also took. 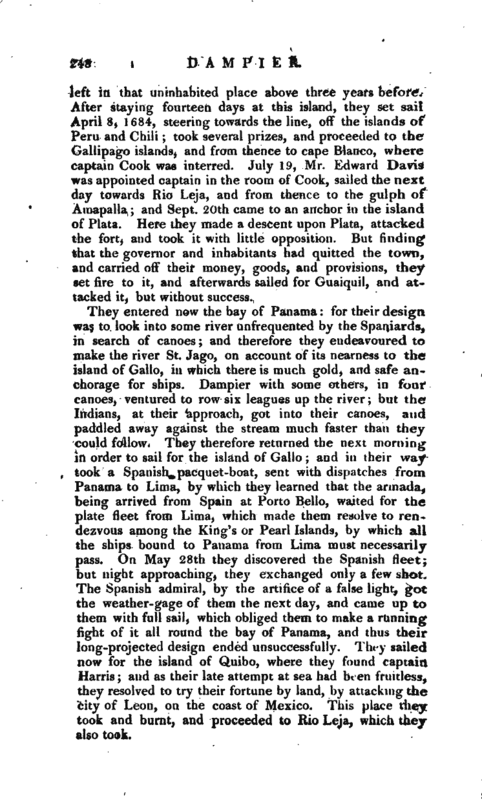 | Here Dampier left captain Davis, and went on board captain Swan, in order to satisfy his curiosity by obtaining a more perfect knowledge of the northern parts of Mexico. They continued sailing to the westward till they came to Guatulco, one of the best ports in the kingdom of Mexico; and from thence to Cape Cerientes, where they waited some time in hopes of meeting with a galleon, of which they had received information. They continued cruizing off this cape till Jan. 1, when their provisions being exhausted, they steered to the valley of Valderas to procure a supply of beef. And while they were engaged in this necessary business, the Manilla ship passed by them to the eastward. After this they steered towards California, and anchored in one of the Tres Maria islands. Dampier, having been long sick of a dropsy, was here buried for about half an hour up to the neck in sand, which threw him into a profuse sweat; and being afterwards wrapped up warm, and put to bed in a tent, found great benefit from this extraordinary remedy. 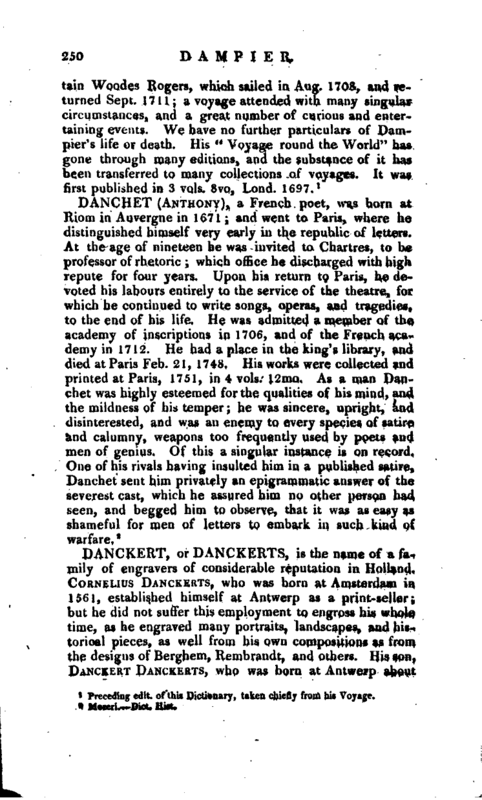 Preceding edit, of this Dictionary, taken chiefly from his Voyage.